I love Twitter. 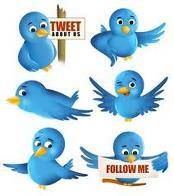 I follow close to 200 tweeters and more than 50 people follow me. Many of my friends don’t get it. The comment I often hear is “I don’t care to know how often so and so goes to the bathroom, or the gym, or shopping.” That’s not what it’s about people. Twitteris a great way to get snippets of information rather than going to multiple websites. You can then link to the stories you want more information about. It’s really a time saver rather than a time waster. I guess that only applies to people who spend a lot of time surfing the web. Twitteralso gives you unique insight into your favorite celebrities. Again, I realize that not everyone cares about the random thoughts of celebrities, as I do. Take for example Busy Phillips (@Busyphilipps25) from Cougar Town. Her latest tweet: “OMG!You guys!! I just got the super sexual pat down at airport security! It was crazy and I couldn’t stop laughing! They REALLY get in there!” She’s very amusing. I also follow @GStephanopoulos and @davidgregory, mostly so I don’t appear totally vapid. Most recently I have moved away from following celebrities to following restaurants, food critics, chefs, etc. These include: @mariobatali, @chefsymon, @nytimesdining, @seriouseats, @tastepost, @komitomarvin. You get the idea. When I recently saw a tweet from Jose Andres (@chefjoseandres) acclaimed chef and owner of Jaleo, Cafe Atlantico, Zaytina, Oyamel, etc. etc. 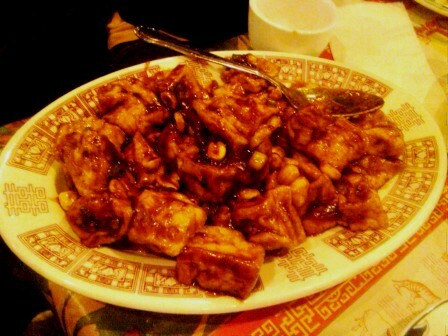 stating “Full Key Restaurant – Wheaton, MD favorite Chinese in the DC area!” I was atwitter! Wheaton is just down the road from where I live, and is host to a number of some pretty top-notch ethnic restaurants. I haven’t tried Full Key, which resides in the same shopping center strip as Max’s Kosher Cafe. If Jose Andres says that this is his favorite Chinese in the DC area, well then I am right on it. It felt a little strange to park in the lot where Max’s is and walk right past it to the low key Full Key. Max’s shwarma is one of my very favorite things to eat in the universe,bar none. But we scurry past Max’s and into Full Key where we are the only non-Asians in the place. I take this as a good sign. The only problem with following a tweet that doesn’t link anywhere, is that it doesn’t give you much information. When it comes to ordering, we are pretty much on our own, although I had jotted down a few notes from some online postings on Chowhound.com and Washingtonian Cheap eats. I order a small portion of roast duck, having read recommendations for it in several places. 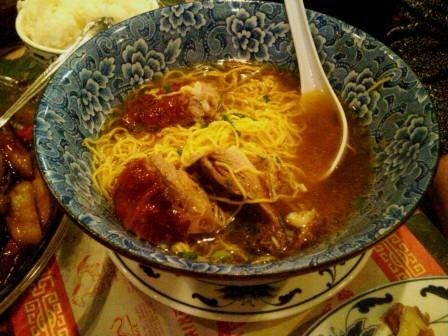 I am informed that there isn’t enough duck to fill my order, but I am encouraged to try the roasted duck noodle soup instead, because it takes less duck I am on my own in eating this dish, as my companions are my vegetarian son and pescaterian husband. I am surprised by the huge serving that is delivered steaming to my table, particularly at a cost of $7.95. The plentiful duck pieces fall off the bone and the generous helping of noodles, while a little difficult to eat daintily, are delicious. 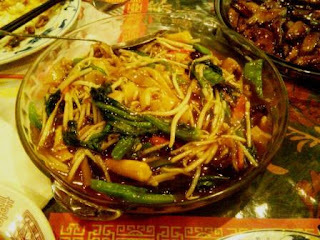 We order three additional vegetarian dishes, knowing it was going to be too much food, but unable to resist the variety of vegetarian dishes at such reasonable costs. No harm in leftovers. The eggplant with hot garlic sauce, a dish that I sometimes love and sometimes don’t depending on the texture, falls into the love category. It could have been a touch spicier but the sauce has a nice tang to it. The vegetable chow foon falls short. I am a fan of the wide chow foon noodle. The noodles are fine but the brown sauce has nothing to distinguish the flavors, and the vegetables are not as plentiful as they could be. The dish is also a bit gloppy. One mediocre dish out of four isn’t so bad, and we leave with our expectations met. Jose Andre’s tweet brought us to Full Kee. I found the food to be solidly good and worth further exploration of some of the meat dishes. I need to return with meat-eating friends. This isn’t a place to come for the atmosphere, which is somewhat non-existent. But that’s what is to be expected of a bargain restaurant and not at all a deterrent. When I get home I tweet a reply to Jose Andres. @chefjoseandres ate at Full Key in Wheaton based on your tweet. great recommendation. kung pao tofu made the vegetarians very happy! That’s ok. I still love Twitter. Those @ signs can definitely get confusing. On the other hand if it weren’t for Twitter I might never have made the quick trip up the road to Full Key, which is certainly a worthy destination for a quick Sunday night Chinese food fix. I would be remiss if I didn’t end with this: follow me @foodobsessed6. Actually the one in Chinatown is called Full Kee and the one in Wheaton is called Full Key. I'm pretty sure they are not related. There is a related Full Kee in Northern Virginia, however. I prefer the one in Chinatown, but after the Andres tweet, i may have to try the Wheaton restaurant too.